Rockaway Fest Coming To Town In October! Here at Lowyat.NET, we are huge fans of Rock and gigs as a whole so when the great guys over at Livescape Asia announced the lineup for their annual Festival, Rockaway, we knew we had to share this. This year, Rockaway Festival will be held at the Helipad at the Sepang International Circuit on the 20th of October coinciding with the Moto GP race weekend.Turning up the volume to 12, Rockaway festival will be headlined by meal giants Soulfly, punk legends MxPx All Stars and metal core sensations Unearth. 6 Local bands will be playing alongside the 3 US bands on the main stage as well as 10 more acts on the WKND Session stage. On the Local Front, bands like Hujan, Love Me Butch, Massacre Conspiracy, Bunkface, I, Revival, The Padangs, Go Gerilla and the venerable Twilight Actiongirl have been confirmed. That’s not all though as the full list is yet to be revealed and will only be shared in September. 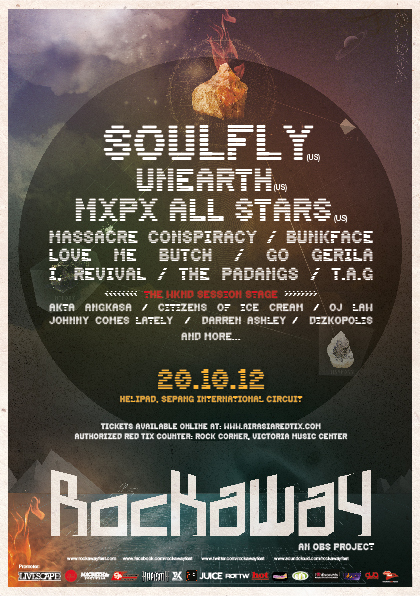 Tickets for Rockaway festival will go on sale on the 1st of August 2012 and will be available at Rock Corner, Victoria Music outlets and Air Asia Redtix. If you want to get tickets, better get them quick as early bird tickets go for RM108, Pre-sale for RM138 and if you leave it too late, RM178 at the door.